Maa Vaishno Devi is one of the most revered and sacred place of northern India in state Jammu. This temple is famous for its magnificence and beauty due to its location on the hill. 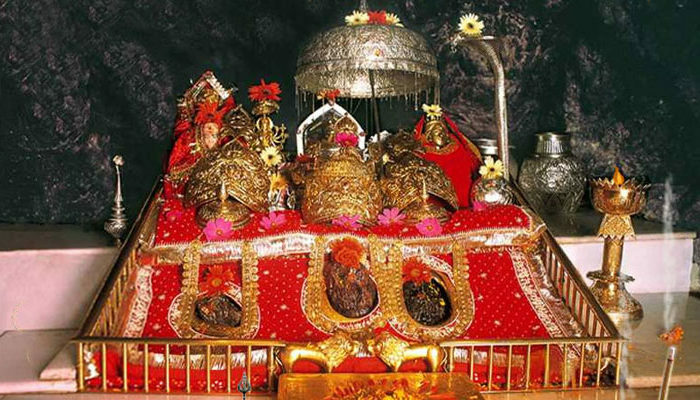 Vaishno Devi is also one of the same places that are considered to be the home of Maa Vaishno. The temple is situated at a distance of 5,200 feet and about 14 kilometers from Katra in Jammu. Every year millions of pilgrims visit this temple. This is the second most visited religious shrine in India after Tirumala Venkateswara Temple. Although many mythological stories are prevalent in connection with Mata Vaishno Devi, the main 2 stories are more prevalent. According to the story, once the mountainous mother was pleased with the devotion of one of her most devout devotees, he rescued her shame and gave evidence of her existence to the whole creation. 2 km from present-day Katra town The devotees of Maa Vaishnavi lived in the village of Hansali, situated at a distance of Shridhar. He was sad due to being childless. One day he invited the virgin daughters for Navratri worship. Mother Vaishno daughter came in between her daughter. After the worship, all the daughters went away but Mother Vaishno Devi stayed there and said to Sridhar, 'Invite everyone to invite your house bhandare'. Sridhar accepted the suggestion of that divine daughter and conveyed the message of Bhandara in neighboring villages. While returning from there, he invited me to his other disciples along with Guru Gorakhnath and his disciple Baba Bhairavnath ji. After getting the invitation for food, all the villagers were surprised that she is a girl who wants to have food for so many people? After this, many villagers came to Shridhar's house and gathered for food. Then the daughter-in-law Vaishno Devi started serving food to everyone with a strange character. While serving food she went to the bride Bhairavnath. Then he said that I would eat meat and drink in the place of Kheer-Puri. Then the daughter-in-law explained to her that this Brahmin food is here, no meat sauce is eaten in it. But Bhairavnath kept himself busy with his point of view. When Bhairavnath wanted to catch the girl, then the mother knew her treachery. Mother changed in air form and flew towards Tricolor Mountain. Bhairavnath also followed them. It is believed that Hanuman was also Pawanpuranta to protect her mother. According to the belief, lord Hanuman was also with him for the protection of Mother at that time. When Hanuman ji was thirsty, on the request of his mother, he lifted an arrow from the bow with a bow and removed his water and washed his hair in that water. Today this holy water channel is known as Banganga, which has got rid of all the exhaustion and troubles of devotees by drinking holy water or bathing with it. During this period, Mother entered a cave and practiced for nine months. Bhairavnath also came behind them. Then a sadhu told Bhairavnath that you who are considered to be a daughter, it is Adashakti Jagadamba. So leave the pursuit of that superpower. Bhairavnath did not listen to the sadhu. Then the mother went out on the other side of the cave and made a way out. This cave is famous today as Ardhkumari or Adikudi or Garbajoon. The first step of half-queen's mother is Paduka. This is the place where the mother ran away - she had seen Bhairavnath after running away. The girl came out of the cave and took the form of Goddess. Mother warned Bhairavnath and asked to go back. Still, he did not believe it. Mother went inside the cave. Then to guard Mother Hanuman fought with Bhairav outside the cave. Bhairav did not give up even when Veer Hanuman began to falter, then Mata Vaishnavi took the form of Mahakali and killed Bhairavnath. Bhairavnath's head was dropped in the Bhairav Valley of Trikute Mountain, 8 km from Cuttack Bhawan. The place is known as the temple of Bhaironath. The place where Maa Vaishno Devi slaughtered Bhairavnath was famous as the sacred cave or the building. At this place, Maa Kali (right), Maa Saraswati (middle) and Maa Lakshmi (left) are inseparable in the cave as Pindi. The common form of these three is called the form of mother Vaishno Devi. Some of these devotees and devotees and idols etc. established by the former kings of Jammu and Kashmir, along with these three grand clans. It is said that after his execution, Bhairavnath had repented of his mistake and he begs for forgiveness from his mother. Mata Vaishno Devi knew that the main intention of Bhairav was to get salvation after attacking them, not only gave Bhairav freedom from the cycle of rebirth but giving it a boon, said that my philosophy would not be considered as complete Until a devotee will not see you after me. 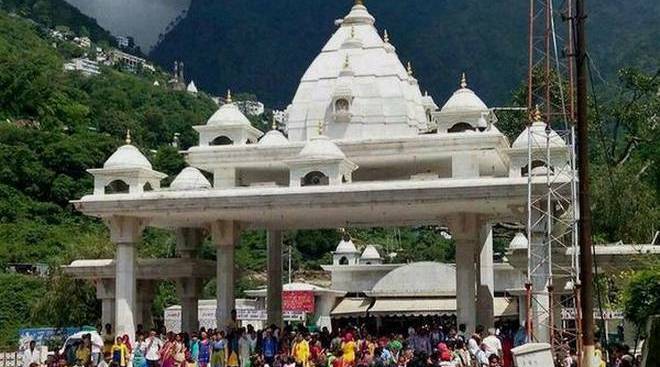 According to the same belief, even after seeing the devotees of Vaishno Devi, devotees go to the temple of Bhairavnath on a steep climb up to 8 km. Meanwhile, Vaishno Devi assumed the shape of a rock with three bodies (head) and became meditative forever. Meanwhile, Pandit Shridhar became impatient. They proceeded towards the Trikuta Mountains on the same path as they had seen in the dream, finally, they reached the door of the cave; they made their daily routine worship of 'Pindi' with many methods, the Goddess was pleased with her worship, Appeared and blessed them. Since then, Shridhar and his descendants have been worshiping Goddess Vaishno Devi. In the Hindu mythology, in the world, due to the loss of religion and the rise of the powers of law, Sat, Raj and three forms of Adi shakti, Mahasaraswati, Mahalaxmi and Mahadurga manifested a girl to protect religion with her collective force. This daughter is descended as the daughter of Pandit Ratnakar in Rameshwar, India's southern seacoast in Tretayuga. For many years, childless Ratnakar gave the child the name of Trikuta, but due to the manifestation of Lord Vishnu in the form of Vishnu, it became known as Vaishnavi. When she is about 9 years old when she knows that Lord Vishnu has also embraced this land as Lord Sri Ram. Then he considered Lord Shriram as a husband and started harsh persuasion to get them. Then saw the medal daughter on the beach. The girl asked Lord Sri ram to accept her as his wife. Lord Sri ram told the girl that he had married Sita in this birth and took a vow of marriage. I will embrace Kalki in Kikriyalug and accept you as wife. By that time, you go to the Himalaya range of Trikuta Mountain and do the recitation and keep on doing good for the world by destroying the sufferings and sorrows of the devotees. When Shri Ram conquered Ravana, then the mother decided to do Navaratri. Therefore, in the above context people recite the Ramayana in the nine days of Navratri. Shri Rama had promised that the praise of Maa Vaishno Devi will be sung by all the world, Trikuta will be known as Vaishno Devi and will be immortal forever. There are many stories about Mata Vaishno Devi. According to a famous ancient belief, mother was pleased with the devotion of a devotee of Mata Vaishno, Shridhar, and she gave the testimony of her existence to the world. Once Brahmin Shridhar kept the maternity store in his village and invited all the villagers and sadhus to come to Bhandara. In less time, the passenger who wishes to visit the mother can also take advantage of the helicopter facility. 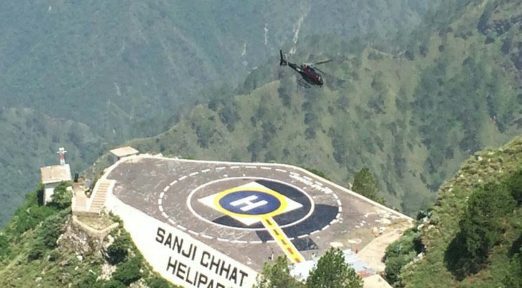 After spending around 2200 to 2800 rupees, the devotees can reach from 'Katrina' from Katra to reach the helicopter from the helicopter (Bharatvnath temple a few km away). For the first time, the villagers did not believe that the poor Sridhar was doing the Bhandara. To keep the shadow of her devotee Shridhar, the mother Vaishno Devi came in the house with the form of a daughter. Sridhar was also invited to Bhairavnath along with his disciples. In Bhandara, Bhairavnath talked about consuming meat instead of kheer-Pudi, then Sridhar expressed disagreement over it. Due to Bhairavnath's stubbornness on food, Kanyarupati Mata Vaishno Devi tried to explain Bhairavnath, but Bhairavnath did not accept her. When Bhairavnath wanted to capture that girl, then the girl ran from there to the Trikuta Mountains and Vaishno Devi, the daughter-in-law of that girl, did austerity for nine months in a cave. Lord Hanuman was guarded to protect Mother beyond this cave. Today this sacred cave is known as 'Ardakvari'. There is also Paduka of the mother's feet near the quadrangular. This is the place where the mother had seen Bhairavnath turning away from running. It is said that Hanumanji was with Maa Vaishno Devi only for the protection of the mother. When Hanumanji was thirsty, on his insistence, on the request of his mother, he lifted an arrow from the bow with a bow and removed the water flow and washed his hair in that water. Today, this sacred stream is known as 'Banganga', due to which drinking holy water or taking bath with it all the diseases of the devotees are dispelled. The place where Maa Vaishno Devi slaughtered Bhairavnath was famous as 'Bhawan' in the whole world today. At this place, Mother Kali (right), Saraswati (Madhya) and Mata Lakshmi Pindi (left) are inseparable in the cave, in whose place only one gets a glimpse, all the sufferings of the devotees are dispelled. The combined form of these three is called the form of mother Vaishno Devi. On the slaughter of Bhairavnath, the place where he fell 8 km away from Sheesh Bhavan, today the place is known as 'Temple of Bhaironath'. It is said that after his execution, Bhairavnath had repented of his mistake and he begs for forgiveness from his mother. Mata Vaishno Devi, giving a boon to Bhairavnath, said that my philosophy will not be considered as complete until a devotee will see you after me. Jammu is the first stop to visit Vaishno Devi. You can reach Jammu by bus, taxi, train or airplane. J Broad is connected by the gauge line. In the summer, there is a sudden increase in the number of passengers going to Vaishno Devi, so special trains are run from Delhi to Jammu for the convenience of passengers annually by the Railways.Jammu is located on National Highway No. 1A of India. So if you want to reach Jammu by bus or taxi, you will not have any problem. You can easily get a bus and taxi from Jammu to many major cities of north India. Journey to Mother's House begins with Katra, which is a village in Jammu district. Distance from Jammu to Katra is about 50 km. You can reach Katra by bus or taxi from Jammu. You will find many buses for Katra from Jammu railway station, from which you can easily reach Katra in 2 hours. If you want to reach Katra with a private taxi, you can travel from taxis to Katra by spending 500 to 1000 rupees, which will take you to Katra in approximately one hour. Vaishno Devi travel begins with Katra. Most travelers start their journey by resting here. For the visit of the mother, there is a continuous process of climbing overnight travelers. 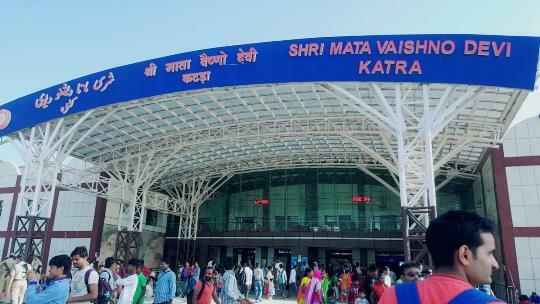 Katra offers free 'travel slip' for mother's vision only.Only after taking this slip, you can start climbing from Katra to Maa Vaishno's court. Three hours after taking this slip, you have to enter the 'Gan Ganga' checkpoint before climbing and you can start climbing only after checking the luggage. If you do not enter the check post for three hours after taking a trip slip, your travel slip can be canceled. Therefore, it is convenient to take a trip slip while starting the journey.There is a snack and food arrangement at the place of pilgrimage. In this difficult climb, you can rest a little while drinking tea and coffee and start your journey again with the same passion. Clock rooms are also available in many places of climbing up to Katra, Bhawan, and Bhawan, where passengers can easily climb with their luggage on fixed duty. .In less time, the passenger who wishes to visit the mother can also take advantage of the helicopter facility. After spending around 2200 to 2800 rupees, the devotees can reach from 'Katrina' from Katra to reach the helicopter from the helicopter (Bharatvnath temple a few km away). Nowadays, a battery car has been started for climbing from semi-quarters to the building, of which about 4-5 passengers can sit together. Some devotees walk on foot to see the cave of Mother and some rent a sedan, horse or pattu to make this difficult climb. You can book the local people on rent to take the children to the climb, who climb your children on the back of the fixed duty and climb. For a person Katara from the Katra (sacred cave of the mother Vaishno Devi), up to 250 to 350 rupees for the climbing palanquin, pattu or horse. Apart from this, you will have to pay an extra fee to accommodate small children or to sit on the overweight person. the lodge:-For travelers arriving in the maternal house, there are many hamlets and halls of Maa Vaishno Devi Shrine Board at places such as Jammu, Katra, Bhawan etc. In which you can relax the excitement of your journey, whose prior booking will help you with difficulties Can avoid You can also stay in private hotels if you wish. In the court of Mother Vaishno Devi, devotees come in the number of millions every day in nine days of Navratri. Many times a growing number of devotees create such a situation that the slip has to stop traveling slip from the slip counter. This year, more than 50,000 devotees are reaching Katra for Vaishno philosophy every day in Navratri. There are many sights and hill stations near Katra and Jammu, where you can enjoy the coolest Haseen Ladies of Jammu. In Jammu, there are places to see Amar Mahal, Bahu Fort, Mansar Lake, Raghunath Temple etc. Patni Top is a famous hill station about 112 km from Jammu. Here you can also enjoy snowfall in winter. Near Katra, there are many tourist sites like Shiva Khori, Jhajjar Kotoli, Sanasar, Baba Dhansar, Manantailai, Kud, Battote etc. 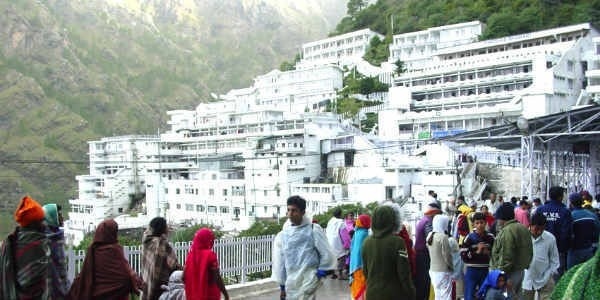 By the way, devotees visit Vaishno Devi for year-long devotees all over the world, but the good weather here in summer. The minimum temperature of the building goes up from 3 to -4 degrees in winter and there is the danger of rock climbing from this season. To avoid traveling in this season. * Do not use steps for climbing blood pressure patients. Being situated at the height of the building, even in the climb, there may be problems related to vomiting and jaggery, from which you must keep essential medicines with them. As far as possible, take the goods with you as far as possible, so that there is no problem with climbing. The stick in walking will prove to be very helpful for you. * Trekking shoes will be very comfortable for you in climbing.